Small scale mine - 4 hectare lease on an island. Great potential as a working mine with tourism development opportunity. Zebra Stone is a unique sedimentary/shale formation that has banded brown and whit patterns. Only found on a seam running through Lake Argyle and only two other working mines on this seam. In very high demand from tourists as a souvenir or high priced jewelry. Located on Lake Argyle in the Kimberley region of Western Australia. Small scale mining project on an island. Lease encompasses entire island and has great complimentary tourism development potential. Zebra Stone is a unique sedimentary formation that is only found in the Kimberley region of Western Australia near Lake Argyle. Sought after by tourists and mineral collectors. Rapidly expanding tourism industry in the Kimberley and a nearby resort means that demand for this stone is increasing and there is a ready market nearby at the Lake Argyle Resort. 650 million year old sedimentary formation. Unique brown and white banded or spotted patterns have not been discovered anywhere else in the world. The seams of Zebra Stone are exposed at both the southern and northern end of Lake Argyle plus on Remote Island. The seam runs parallel to the Halls Creek fault line. Zebra Stone was first discovered by the early settlers to the East Kimberley region in the late 1800's. Mining leases were first pegged out in the early 1900's and the demand for Zebra Stone has risen dramatically in the past 20 years as the tourism industry in the Kimberley has developed. 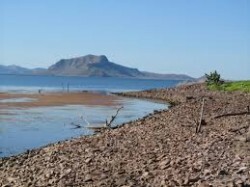 Lake Argyle filled in 1974 submerging much of the quality deposits, leaving exposed seams accessible at the northern and southern ends of Lake Argyle plus one island - Remote Island. The lease encompasses an entire island with a land area of up to 4 hectares dependent upon the level of Lake Argyle which can vary dramatically depending on the volume of wet season rainfall. There is ready market for the stone nearby (17km away) at the Lake Argyle Resort which caters for up to 2,000 people per day in the peak tourist season. Securing land tenure is often a major stumbling block to any innovative project in the Kimberley, therefore to own a mining lease on an island means that the nature of the lease allows some development in association with your mining activity. The nature based tourism potential of this area is huge and only just beginning to be exploited. This island offers a great package whereby there is good demand for the stone as a tourist souvenir and jewellery plus a small low key high value ecotourism experience could be developed on the island in association with the lease. Nature observation – Lake Argyle is recognised as a RAMSAR wetland, is a nature reserve, is home to approximately 30,000 freshwater crocodiles (harmless to humans unless threatened), 26 species of native fish including the highly sought after Barramundi, more than 240 species of birds and is frequented by very few people. There is no other development opportunity like it and access to land tenure on other islands is extremely difficult due to native title issues and bureaucratic red tape. The nearby Lake Argyle Resort is very supportive of any small scale tourism development projects/tours and would be very keen to support the development of a Zebra Stone cutting/polishing/display centre at the resort.